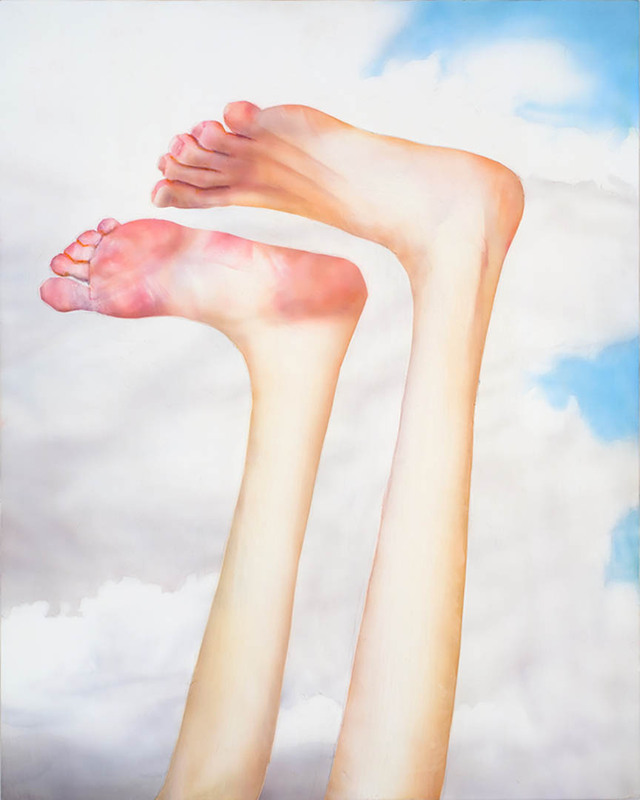 “Feet Up,” a 2013 painting in polymer emulsion on honeycomb panel, 23.75 by 19 inches, by Robert Feintuch. The painting is in the collection of the Bates Museum of Art. The old maxim says, “Show ’em, don’t tell ’em.” But Robert Feintuch, senior lecturer in Bates’ art and visual culture department, is doing both in the coming weeks. Celebrated for quirky, psychologically pointed depictions of the male form that are anything but heroic, Feintuch has four recent images in the group show Intimacy in Discourse: Reasonable and Unreasonable Sized Paintings at Mana Contemporary in Jersey City, N.J. Meanwhile, if you’re in Chicago on Nov. 3, swing by the School of the Art Institute of Chicago to hear Feintuch discuss his work. Reviewed in the Dec. 23 Forbes, the Mana show explores artists’ motivations for making small paintings — in this case meaning works of, say, two or four square feet — and viewers’ reactions to them. Feintuch is one of the 18 artists who typically work on this scale. While the Mana show offers the “Reasonable Sized” works, a concurrent show of the “Unreasonable Sized Works” is at Manhattan’s School of Visual Arts Chelsea Gallery.